Having problems with your AirPods? A simple reset should do the trick. Apple's AirPods have a lot going for them — they're ultra-portable, sound great, and offer easy access to Siri — but as with any piece of electronics, they can malfunction or fail. Whether you're having battery issues with your AirPods, running into pairing problems, or other quirks, here's how to troubleshoot your AirPods and give them a clean start with your iPhone or iPad. I can't tell if my AirPods are charged! My AirPods' battery is draining too quickly! My AirPods went through the washing machine! I dropped my AirPods in the snow/sand! My AirPods won't turn on! As you use Apple's AirPods, you might run into a troubleshooting issue or two. Here are some of the most common ones we've seen over the last year. Apple's AirPods can hold their charge for a lengthy period of time when not connected to a charger — even while buried in a bag. But when you pull them out, how can you tell if they're still charged? The answer lies in both your AirPods case and your connected devices. When fully charged, each earbud has a full 5-hour listening charge/two-hour cellular talk time charge (10 hours/4 hours total if you alternate your listening between earbuds), and your case has 24 hours listening/11 hours of talk time of recharge juice (an additional 12 hours/5.5 hours per earbud). If you see no light: Your AirPods and their case are dead and need to be charged. If you see an amber light and your AirPods are in their case: The AirPods are charging. If you see a green light and your AirPods are in their case: The AirPods are charged. If you see an amber light and your AirPods are not in their case: The AirPods case has less than one full recharge remaining for its AirPods. If you see a green light and your AirPods are not in their case: The AirPods case has at least one full recharge remaining for its AirPods. If you see an amber light while your AirPods are connected to a charger: Your AirPods are currently charging. If you see a green light while your AirPods are connected to a charger: Your AirPods are fully charged. If you see a white flashing light: Your AirPods have been reset and are ready to connect to your iPhone, iPad, Mac, or other device. If you see an amber flashing light: Your AirPods have encountered a pairing error and you'll need to reset them. When your earbud hits 10% battery remaining, you'll hear a "power down" chime. If your earbud has 10% or less battery remaining when you first connect it, you'll hear this chime immediately after the "connected" chime. When your earbud hits 1% battery remaining, you'll hear the "power down" chime a second time, and the earbud will turn off. Open the case near a connected iOS device and press the status button on the rear of the case once to see a pop-up readout with the case and AirPods earbuds battery percentage remaining. Open Control Center on your iOS device and tap the Music widget's AirPlay indicator to see battery readings for all connected headphones. Open the Today screen on your iOS device and check the Batteries widget (or enable it under the Edit button) to see charge time for all your connected headphones and other devices. Non-iOS devices should also be able to check this status by going to their Bluetooth connections. If you're having issues with your AirPods battery draining faster than its stated charge capacity, it may be time for a replacement. Lithium-ion batteries have limited shelf life, and depending on how frequently you use your AirPods, you may need to replace your battery as soon as a year and a half after purchasing. Apple offers battery replacements for $49 per earbud, so it's a pretty straight-forward process. That said, we've also seen pairing errors and iOS bugs drain Apple's earbuds more quickly than they should: Before you bring in your AirPods for service, try fully draining and recharging your case and buds; if that doesn't work, we recommend resetting your AirPods and seeing if that improves your battery performance before contacting Apple Support. My left/right AirPod has little or no sound, or it's stopped working altogether! If one of your AirPods has mysteriously stopped playing sound, or the sound is muffled, the first thing to check is whether it's clean: Because the AirPods sit inside your ear canal, they can very quickly accumulate ear wax and all sorts of nasty cruft. After a cleaning, try listening again: If you're still having issues hearing through that earbud, check listening on a different device — does it do the same thing on an iPad or the Mac? If so, it may be time to reset your AirPods or replace the earbud. The easiest ones to rule out are the external factors: Try charging your AirPods case with a different cable and charging brick, in a different location. If they charge, try using the original cable, but the new brick — if they still charge, your power brick is at fault. If they don't charge, your Lightning cable or your power outlet is at fault. If you've tried the above combinations and still can't get a charge, try cleaning your AirPods and their case to make sure the contact-based chargers are clear of any debris. If you still can't get anything to work, it may be time to make an Apple Support appointment. If you have friends with working AirPods, you can further narrow down potential culprits by testing your earbuds in their case: If your earbuds charge in their case, your case is faulty; if your earbuds don't charge, you may need to replace the entire thing. Yikes! 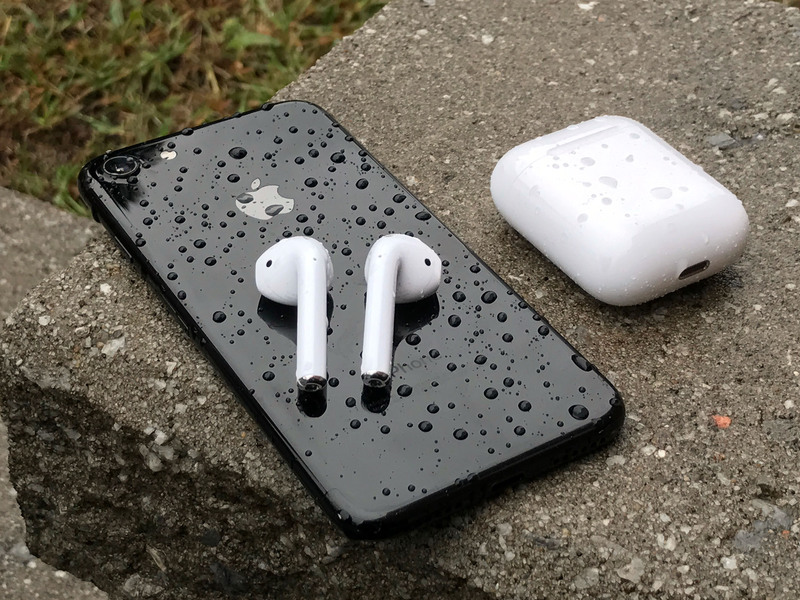 Though the AirPods aren't officially sweat- or water-resistant, we have heard of AirPods surviving water rides thanks to their case: It has (in a number of cases online) protected AirPods earbuds from suffering water corrosion, but it's also the thing that is most likely to be damaged. Open the case and remove your AirPods earbuds. Surround the case in silica gel or couscous (don't use rice, as it may speed up the water corrosion process) inside of a Ziplock bag (or comparable brand). Let the AirPods dry in the open air. Leave both to dry for 24-48 hours. Put the earbuds back in the AirPods case. Charge the AirPods case for a few hours. Attempt to reset your AirPods. If your case or earbuds aren't working after following these steps, it's time to make an Apple Support appointment. Note: While we don't advocate lying to Apple Support, there's currently no water indicator in the AirPods case or earbuds; if you're still in your first year of ownership, you may be able to bring them to an Apple Store and claim ignorance to get them replaced gratis. I dropped my AirPods in the snow/sand and I can't find them! If you drop one of your AirPods in the snow, how do you find it again? With a little luck — and a lot of sound! If your AirPods are DOA, there are a few things you can do before panicking. First and foremost: Check your battery level and give the AirPods a good, long charge (6+ hours). If you still can't get a response, try a reset and check our troubleshooting tips for unresponsive earbuds. If all else fails, consider booking an Apple Support appointment. Go to Bluetooth and find your AirPods in the device listing. Tap the "i" button on your AirPods. Put your AirPods back in the charging case and close the lid. Press and hold the setup button on the back of the charging case until you see the status light start flashing amber a few times, then flash white. Place your AirPods close to the device you want to pair them to. Follow the steps on the screen to reconnect your AirPods. If you changed the AirPods settings previously, such as double tap to pause, you'll need to set that up again. You tell us, iMore: Found a good fix for troubleshooting your AirPods? Let us know in the comments below! March 2019: Serenity Caldwell contributed to an earlier version of this guide. Added full list of steps to reset your AirPods.